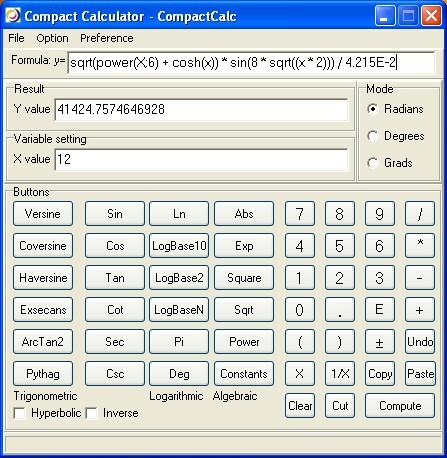 CompactCalc is an enhanced scientific calculator for Windows with an expression editor. It embodies generic floating-point routines, hyperbolic and transcendental routines. Its underling implementation encompasses high precision, sturdiness and multi-functionality. With the brilliant designs and powerful features of CompactCalc, you can bring spectacular results to your calculating routines. ...... You are not limited by the size or the complexity of your mathematical expressions. * Scientific calculations and unlimited expression length. * Parenthesis compatible and unlimited nesting for expression. * Accurate result display - features up to 24 digits after the decimal point for scientific calculations. * Calculation range (1.79E-308, 2.22E308). * CompactCalc has almost hundred of physical and mathematical constants built in, which can be easily accessed and used in calculations. No longer do you have to search the physic textbook for that common physical constant data. * Possibility to enter mathematical formulas as with a keyboard as with calculator-buttons. * The interface is straightforward and very easy to navigate through. KS-Calculator is a powerful, easy-to-use calculator. Calculate your BMI with our free BMI Calculator. LeoCalculator performs calculation of mathematical expressions. Loan calculator with an amortization table that can be printed. Qweas is providing links to Compact Calculator - CompactCalc 4.2.7 as a courtesy, and makes no representations regarding Compact Calculator - CompactCalc or any other applications or any information related thereto. Any questions, complaints or claims regarding this application Compact Calculator - CompactCalc 4.2.7 must be directed to the appropriate software vendor. You may click the publisher link of Compact Calculator - CompactCalc on the top of this page to get more details about the vendor.